To start off…I am an amateur photographer. I still have barely any idea of what I am doing with my amazing Canon Rebel. I highly recommend this camera because without any knowledge of this device I have been able to capture some pretty sumptuous looking pictures. All I know about taking great pictures is to ALWAYS use natural lighting. Most of my pictures are taken right on the windowsill. The bolognese pictures came out so horrible because I was rushing against the sun that was setting very quickly. It was already a rainy day to begin with so odds were not in my favour. In turn, my so called “food styling” was non-existent and I ended up with some pretty drab looking pictures (notice the dark/yellowish hue). But lets face it. If I wasn’t photographing this food for my blog, that would be what a home-cooked dish looked like in most homes, including my own. And that truly is why I decided to do this post. It is to encourage you to make more time to make home-cooked meals! So many people look at photographs taken in recipe books, magazines and blogs and think that they are too difficult. I always hear people say “I could never make that, I am the worst cook!” They also might think that if they make a dish and it looks slightly different in the picture that they have failed. I’m here to tell you that is simply not true. 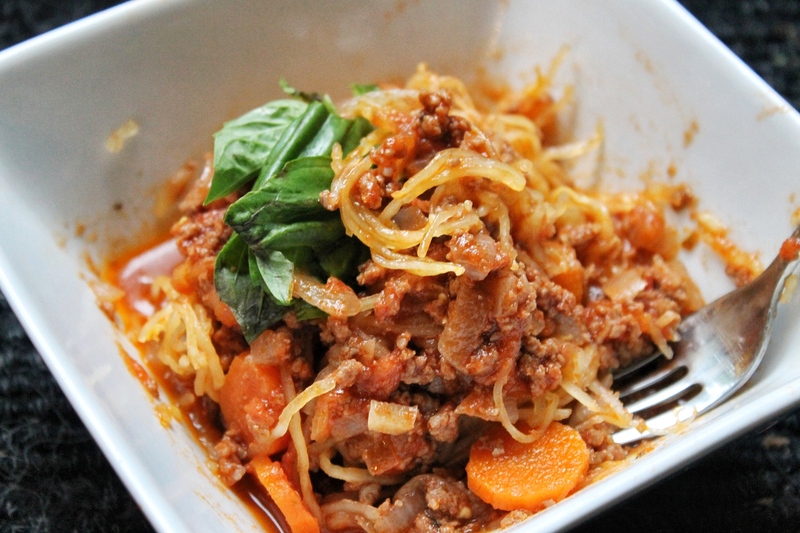 Ok, so I am sure many of you are surprised to see bolognese on here. Many of my recipes are friendly to vegans because my recipes do not contain dairy. Although I do not eat meat on a daily basis, I do still enjoy good quality meat from time to time. (Vegan readers, just skip this recipe for now and check back later!) Especially in the winter, there is nothing more comforting then diving into a bowl of brown rice spaghetti and meat sauce. 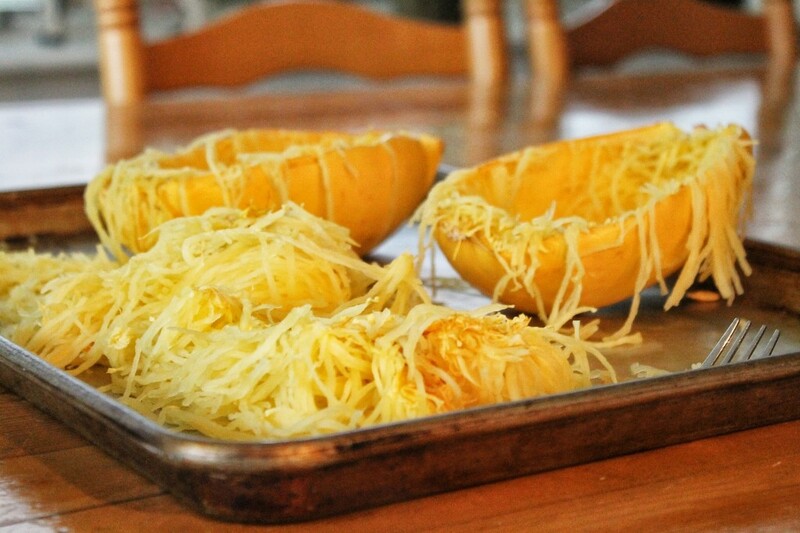 By substituting the pasta with spaghetti squash, the dish has now become a summer staple. I know many clean eaters have different opinions on eating meat. But if you truly enjoy it, then there is no harm in having anything in moderation. Especially if you are getting organic, grass fed beef that has a lower fat content. That is just my philosophy, and many people will agree or disagree. I love food too much to say NO forever to something I really enjoy. This blog is really all about that. I take foods that I truly love and adapt them to make them more wholesome and cleaner without compromising on flavour. 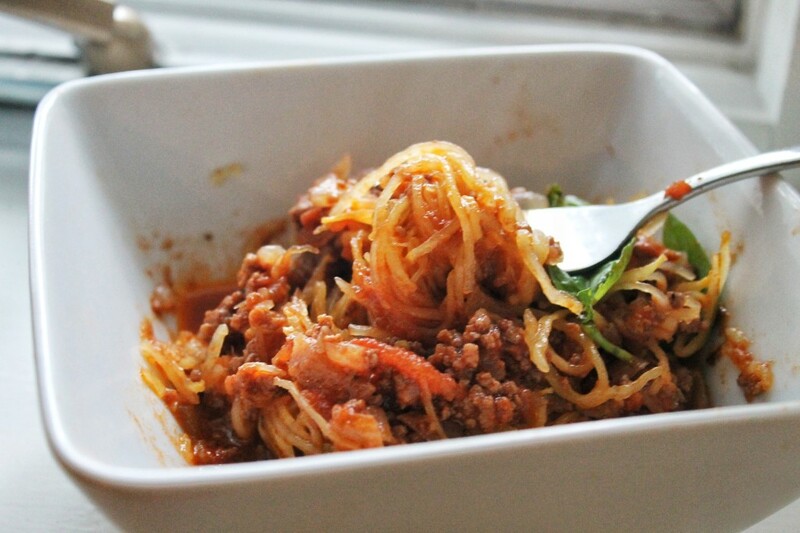 So here is my favourite recipe for clean bolognese, I hope you enjoy! Ps. Another error I made while making this bolognese is cutting the carrots in medallions instead of finely chopping it. By the time I got them in the pot and looked at how odd they looked in there, it was too late. But, they did taste delicious anyway. 1. Preheat oven to 350. 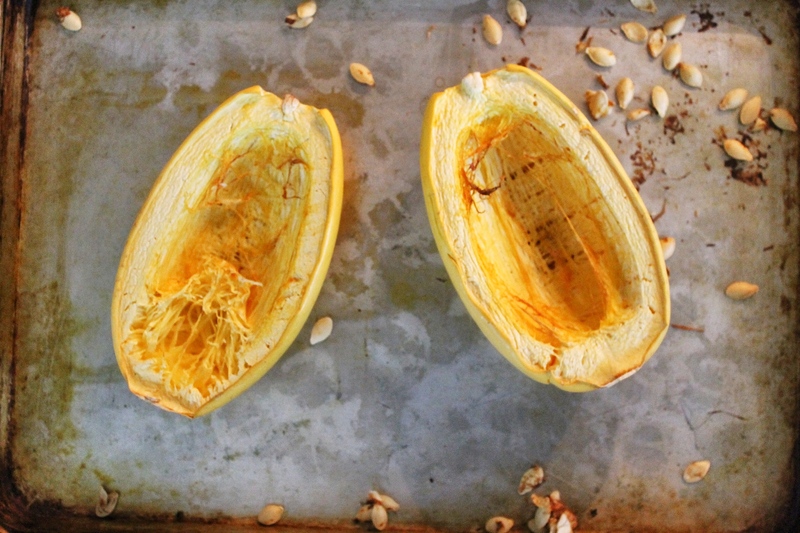 Slice spaghetti squash in half, remove seeds and place on sheet pan and bake for one hour. I also bake the seeds on the pan and eat them later on! Pull strings out using a fork and set aside. 2. Heat olive oil in a large pot on medium heat. Cook onions, garlic and carrots until the onions are translucent and no longer firm. 3.Add oregano, chilli flakes, salt, pepper and beef. Cook beef until it is no longer pink. 4. 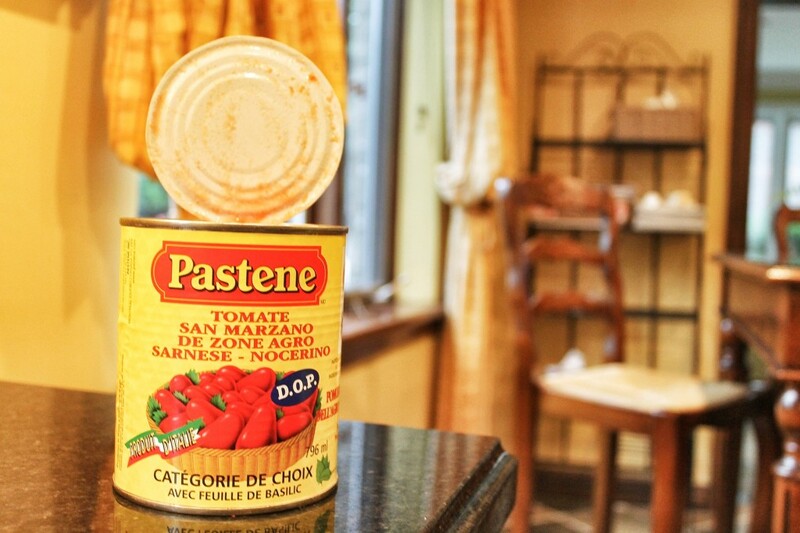 Add tomatoes and tomato paste. Break down the tomatoes using the back of a wooden spoon. 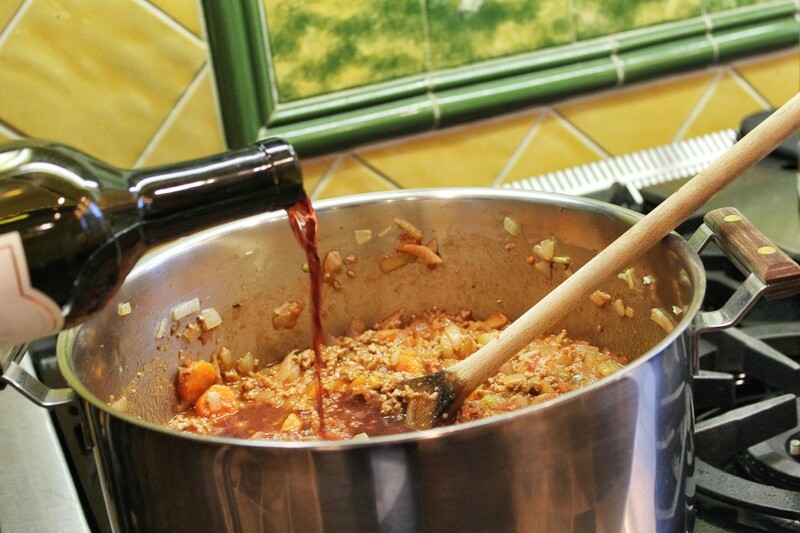 Reduce heat to low and let simmer for at least 35-40 minutes. 5. Add red wine and simmer for another 10 minutes. Add stevia (or other sweetener) if you would like the sauce to be more sweet. 6. Simmer on low for another 10-20 minutes or until the sauce has thickened and the moisture has mostly cooked out. 7. 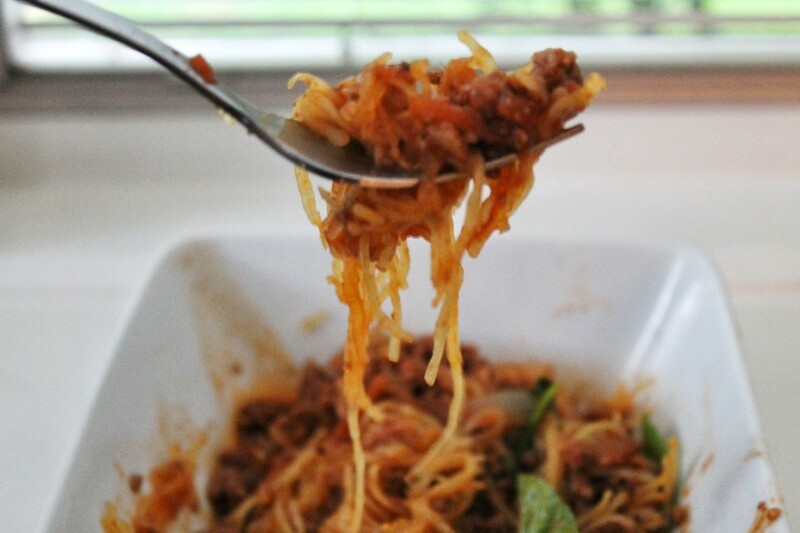 Pour sauce over spaghetti squash and top with fresh basil. This look totally delicious thanks for sharing and nice photos! I made this tonight and it was delicious!! It also impressed my boyfriend, who is the anti-clean eater. A win in my books! Thanks for the recipe. Aw I am so you glad you enjoyed Zanna!